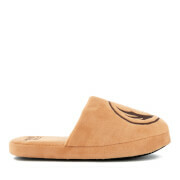 Men's low top slippers from Dunlop. The 'Arthur' slippers comprise a soft, comfortable design with a Velcro side fastening for easy access. Set on a durable sole that offers grip and durability. Complete with a branded tag, an embroidered Dunlop logo and tonal stitching throughout.